LEBANON : The secretary general of the Lebanese Hezbollah resistance movement has described his group as one of the most effective forces in the fight against terrorism across the Middle East region. 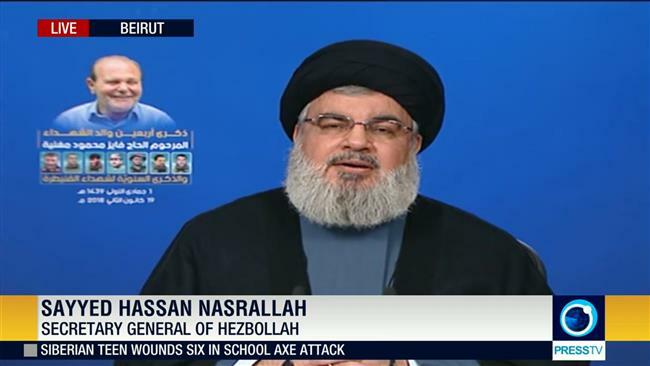 He is Speaking at a ceremony marking the martyrdom anniversary of Hezbollah fighters in Syria’s southwestern Quneitra region on Friday (19/1/2018) afternoon, Sayyed Hassan Nasrallah stated that the sacrifices made by Hezbollah martyrs were behind all victories over US-Israeli plots in the region. “The Lebanese government and the Arab League have both censured attempts meant to normalize ties with the Zionist regime (of Israel),” he pointed out.